These examples are meant to be illustrative, not exclusive. Laboratories should develop defensible procedures that fit their operational environment and jurisdictional requirements. Notes and calculations are provided to clarify these applications. Weight calculations are based upon assumptions that populations are normally distributed. Various terms used in this document are defined in the SWGDRUG Recommendations Annex A. The following examples should not be directly applied to methodology used without first considering the specific purpose of the method and its relevant operational environment. A laboratory receives an exhibit containing 100 bags of white powder. The analyst needs to determine the total net weight of the powder in the 100 bags. This is done by weighing the powder from a sample of the population and extrapolating to the total population. A.1 Determine the population size N. Only bags which have sufficient similar characteristics are placed in the same population. In this example, the contents of all 100 bags are visually consistent in substance amount (about 0.5 gram) and physical appearance (i.e. color, texture, etc. ), hence N = 100. In this example, the analyst chooses a sample size n = 10. The 10 units are randomly selected from the total population. A.3 Measure the weight of the powder in each of the randomly selected units. The weight (X) of the powder in each of the 10 bags is measured by dynamic weighing on a three-place balance (with 0.001 gram readability) as recorded in table 1.1. Table 1.1: Individual weights of 10 bags. A.4 Calculate the average weight per unit, , the standard deviation, s, and the relative standard deviation, RSD. In this example, the laboratory has determined = 0.00185 gram for a three-place balance. A.6 Obtain the uncertainty associated with the calculated average weight, . This uncertainty encompasses the standard deviation as well as the number of measurements performed. A.7 Calculate the combined uncertainty, , associated with the average weight per unit, by combining the standard uncertainties of the average weight, , and the balance used, , via the root-sum-square (RSS) method. A.8 Calculate the extrapolated net weight of the 100 bags, W, and its associated uncertainty, . A.9 Obtain the expanded extrapolated uncertainty, , by using the appropriate coverage factor, k, (Student’s t value for 9 degrees of freedom). Round up the expanded extrapolated uncertainty, , to two significant figures. A.10 Report the total extrapolated net weight and its associated uncertainty by truncating the extrapolated net weight to the same level of significance (i.e. decimal places) as the rounded expanded uncertainty. The amount of powder in 100 bags is 55.3 grams ± 2.0 grams at a 95% level of confidence, determined by weighing 10 bags and extrapolating to obtain the total net weight. The amount of powder in 100 bags is 55.3 grams ± 2.8 grams at a 99% level of confidence, determined by weighing 10 bags and extrapolating to obtain the total net weight. By statistically sampling 10 bags, it is concluded at a 95% level of confidence, that at least 76% of the population contains cocaine. By statistically sampling 10 bags, it is concluded at a 99% level of confidence, that at least 65% of the population contains cocaine. The above statistical inferences on the population as well as for other levels of confidence (depending on laboratory’s policy and decision), can be calculated using the ENFSI DWG Calculator for Qualitative Sampling of Seized Drugs (Reference D.2). This calculator can also be accessed from the SWGDRUG website at http://www.swgdrug.org/tools.htm). Net weights and associated uncertainties extrapolated for other sample sizes are given in Table 1.2. It is noted that as the sample size n increases, the expanded extrapolated uncertainty, , decreases. Also, for a given sample size n, the expanded uncertainty is larger when a higher level of confidence is used. Table 1.2: Calculations for sample sizes of n = 3, 5, 10, 20 and 30. Raw data of individual sample weights used are given in Table 1.3. Table 1.3: Individual sample weights of 30 bags used in examples. Step A.7 shows that the combined uncertainty, , has contributions from: the standard uncertainties of the average weight, , and that associated with the balance used, . If a balance of a different uncertainty is used, the combined uncertainty will change. Similarly, the distribution of the individual weights of the population will affect the combined uncertainty. To illustrate the impact of the weight distribution of the population on the extrapolation of the total net weight, another 30 bags from a different population (one that has been tested to be normally distributed) are individually weighed on the same balance. The individual weights of these 30 bags are given in Table 1.4 below and the associated calculations given in Table 1.5. It is noted that the RSD values listed in Table 1.5 are all much smaller than those for Table 1.2 (above). This consequentially gives rise to smaller expanded extrapolated uncertainty, , for all sample sizes in Table 1.5 as compared to Table 1.2. Table 1.4: Individual sample weights of 30 bags from a normally distribution population. Table 1.5: Calculations for sample sizes of n = 3, 5, 10, 20 and 30. The scenario is the same as Example 1, where the laboratory receives an exhibit containing 100 bags of white powder. Sentencing penalty in this jurisdiction increases if the amount of substance containing cocaine exceeds 25 grams. The analyst will use statistically based sampling without replacement to determine, to a 99% level of confidence, if the jurisdictional weight threshold is exceeded. This example does not take purity of the powder into account because it is not jurisdictionally relevant. B.1 The analyst needs to determine how many bags must be sampled to determine if the 25-gram threshold weight is exceeded. 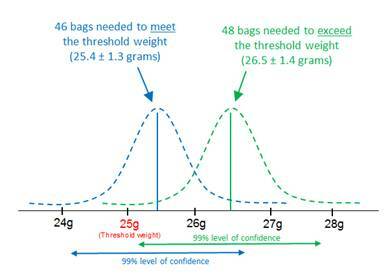 To obtain an estimation of the number of bags that must be sampled to meet the threshold weight, the specified statutory threshold weight (25 grams) is divided by the average net weight ( ) per unit (obtained from Example 1). The extrapolated net weight of 46 bags results in 25.4 grams ± 1.3 grams (See blue dotted line in figure below. The calculation to estimate the uncertainty of the measurement is not shown here. Refer to Steps B.3 to B.5 below for calculation process). The lower bound of 24.1 grams falls below the statutory threshold. To calculate the number of bags needed for the lower bound of the extrapolated net weight to exceed the statutory threshold weight, the specified statutory threshold weight (25 grams) is divided by the difference between the average net weight ( ) per unit and the confidence interval with coverage factor k = 3.250 using Student’s t value for 9 degrees of freedom based on a sample of 10 bags (see Example 1). Therefore, a minimum of 48 bags must be sampled to provide strong evidence that the threshold weight is exceeded. The measurement of uncertainty associated with weighing 48 bags is 1.4 grams at a 99% level of confidence (see detail calculation in Step B.4), hence giving a lower bound of 25.1 grams, which is above the statutory threshold. This is depicted by the green dotted line in the figure above. B.2 Determine the sample size n that needs to be qualitatively tested to demonstrate that at least 48 of the 100 bags contain cocaine at a 99% level of confidence. (N = 100, a = 0.01, proportion of positives = 0.48, with no negatives expected), the sample size is determined to be 6. Since the first chance of failure will occur when 47 out of the 100 bags contain cocaine, we want to obtain enough evidence to reject the assumption that there are only 47 bags of cocaine (H0). This is done by calculating the probability of obtaining a positive result at successive sample sizes, n, until it falls below the established significance level (a = 0.01). The probability of randomly selecting 6 units and having them all test positive is too low to occur by chance (below established significance level) if we assume there are only 47 positives in the population. Therefore, we can reject H0 and accept H1, that there are ≥ 48 bags that contain cocaine in the population. Therefore, the number of bags, n, needed for testing is 6. B.3 A total of 6 bags are randomly selected for chemical analysis and confirmed to contain cocaine. Since all 6 bags are found to contain cocaine, it can be stated, to a 99% level of confidence, that at least 48 of the 100 bags contain cocaine. B.5 The analyst compares the calculated extrapolated weight of the 48 bags, W48, minus the expanded uncertainty, , (truncated to the same level of significance) against the statutory threshold of 25 grams. The weight of 48 bags is 26.5 grams ± 1.4 grams calculated at a 99% level of confidence. The lower end of the weight range is = 26.5 – 1.4 grams = 25.1 grams (which is above 25-grams statutory threshold). 1) A total of 100 indistinguishable bags were received. By using statistical sampling of 6 bags, it is concluded at a 99% level of confidence that at least 48% of the population contains cocaine. The extrapolated net weight of 48 bags is 26.5 grams ± 1.4 grams at a 99% level of confidence. 2) A total of 100 indistinguishable bags were received. Using statistical (hypergeometric) sampling and by testing 6 bags, it is concluded that cocaine is present in at least 25.1 grams of powder at a level of confidence of at least 98%. The second report option gives an overall level of confidence of at least 98% for the weight and identity of the powder. Each of these parameters is individually tested at a 99% level of confidence. Where these two statements are not considered to be independent of each other, the Bonferroni correction (Reference D.1, p 155-156) can be used in the calculation of the overall confidence level. This is obtained by determining the value of (1 – 0.01 – 0.01)*100%. If the two statements are considered independent, the multiplication rule of probability can be used instead, giving an overall level of confidence of 99%*99% = 98.01%. As illustrated in this case, if only 6 bags are sampled, the analyst is only 6% confident that all 100 bags contain a substance containing cocaine. giving a sample size of 95. As seen from this example, if the laboratory needs to report on the content of all 100 bags at a confidence level of 95%, a total of 95 bags need to be tested. In contrast, if the laboratory only needs to report on the content of 90 bags at the same confidence level, the number of bags to be tested is reduced to 23 (a reduction of 75%). The laboratory receives a large container with numerous tablets. The analyst needs to determine the total number of tablets present in the container and its associated uncertainty by direct weighing of a sample of individual tablets and extrapolating to obtain the total count. C.1 Determine whether all the tablets in the container can be treated as one population. Since all the tablets in the container are visually similar, they will be treated as one population. C.2 Measure the net weight of all the tablets. The total weight, TW, of the total population of tablets is determined to be 701.5 grams based on dynamic weighing on a balance with 0.1 gram readability. C.3 Choose the number of individual tablets to weigh. In this example, the analyst randomly samples and weighs 10 tablets (n = 10). The weight of each tablet X is determined by dynamic weighing on a balance with 0.0001 gram readability as in Table 3.1. Table 3.1: Individual weights of 10 tablets. C.4 Calculate the average weight per tablet, , the standard deviation of the tablet weight, s, and the relative standard deviation, RSD. C.5 The number of tablets in the container is estimated by dividing the total weight of all the tablets, TW, by the average weight per tablet, . C.7 Calculate the relative uncertainties of both weighing processes. The use of relative standard uncertainties is necessary because the estimated number of tablets is obtained by a division operation (see C.5). C.8 Combine the two relative standard uncertainties ( and ) to obtain the combined relative standard uncertainty, , associated with the extrapolated tablet count. C.9 Determine the absolute combined uncertainty, , for the tablet count by multiplying the combined relative standard uncertainty, , by the estimated number of tablets. C.10 Expand the combined uncertainty, , using the appropriate coverage factor k.
At a 95% level of confidence for n = 10, the coverage factor k = 2.262. Expanded uncertainty, = * k = 40.004 * 2.262 = 90.489 tablets. If a 99% level of confidence is used, the coverage factor k = 3.250. Expanded uncertainty, = * k = 40.004 * 3.250 = 130.013 tablets. C.11 Report the total extrapolated tablet number, and its associated uncertainty, truncating or rounding to the nearest whole number per laboratory policy. In this example, the number of tablets is truncated while the associated uncertainty is rounded up for a conservative approach. The number of tablets is an extrapolated estimated value based on the individual weights of 10 tablets and the uncertainty value represents an expanded uncertainty at a 95% level of confidence. The number of tablets is an extrapolated estimated value based on the individual weights of 10 tablets and the uncertainty value represents an expanded uncertainty at a 99% level of confidence. Examples of other sample sizes n = 3, 5, 30 and 50 taken from the same population are given in Table 3.2, together with data from n = 10 for comparison. Raw data of tablet weights used for Table 3.2 are given in Table 3.3. It is noted that the extrapolated combined uncertainty, , is smaller as the sample size gets bigger. Also, for a given sample size n, the expanded uncertainty, , is larger when a higher level of confidence is used. It should be the laboratory’s decision and policy to determine the sample size n needed for the extrapolation of number of units. Using a smaller n is more time efficient but results in a much larger expanded uncertainty, . Using a larger n takes more time to complete the analysis but has the benefit of a smaller expanded uncertainty. Table 3.2: Calculations for sample sizes of n =3, 5, 10, 30 and 50. Table 3.3: Individual weight of tablets for Table 3.2. 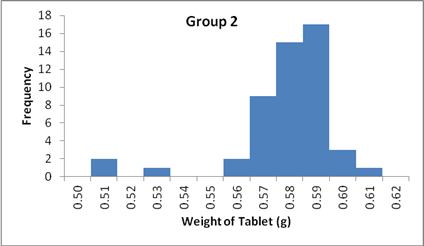 To illustrate the impact of the weight distribution on the extrapolation of the unit count, three distinct populations of weights of tablets were evaluated. All groups contain 50 tablets. Tablets from each group look visually similar. The total weight of each group of 50 tablets is weighed using a one-place balance (with uncertainty of 0.3581 gram). 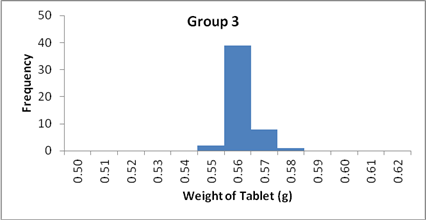 A sample size of 10 tablets from each group is randomly sampled for individual weighing using a four-place balance (with uncertainty of 0.000484 gram). The calculations for the extrapolation of tablet count for the three groups are shown in Table 3.4 below. The RSD of the sample, and hence the expanded uncertainty of the extrapolation, depends on the distribution curve. A population with a smaller spread will yield a smaller standard deviation and hence smaller expanded uncertainty. Table 3.4: Calculations for 3 groups of tablets each with sample sizes of 10. 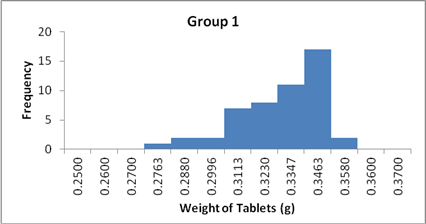 Figure 1: Histograms showing the spread of weights for the 50 tablets in the three groups. The spread of the data in group 1 is larger and further from normality as compared to Group 3. D.1 Kutner, M. H., Nachtsheim, C. J., and Neter, J. 2004. Applied Linear Regression Models, 4th edition, McGraw-Hill. D.3 EURACHEM/CITAC Guide. Quantifying Uncertainty in Analytical Measurement, Third Edition (2012). ISBN 978-0-948926-30-3. D.4 Guide to the Expression of Uncertainty in Measurement (GUM). ISO, Geneva (1993). (ISBN 92-67-10188-9) (Reprinted 1995: Reissued as ISO Guide 98-3 (2008), also available from http://www.bipm.org as JCGM 100:2008). D.5 ASCLD/LAB. 2013. ASCLD/LAB Policy on Measurement Uncertainty. AL-PD-3060 Ver 1.0. D.6 Mario, J. 2010. A probability-based sampling approach for the analysis of drug seizures composed of multiple containers of either cocaine, heroin, or Cannabis. Forensic Science International 197: 105-113. Where populations from which samples are selected diverge substantially from a normal distribution, weight extrapolations using small sample sizes (e.g. n = 3) may yield unreliable extrapolations and associated uncertainties. An alternative approach could be to calculate the total net weight of the powder by subtracting the extrapolated weight of the empty bags from the total gross weight. This will entail different calculations. If the bag contents are visually dissimilar, they need to be separated into different groups before continuing with the analysis. A “random sample” is defined as “the sample so selected that any portion of the population has an equal (or known) chance of being chosen. Haphazard or arbitrary choice of units is generally insufficient to guarantee randomness” in SWGDRUG Glossary of Terms and Definitions, Annex A. See SWGDRUG Supplemental Document SD-3 for discussion on weighing processes (dynamic and static) and measurement uncertainty. The laboratory’s requirement should ensure that the variability of the measurements is small enough that all samples can be considered as belonging to the same population. ENFSI Guidelines on Representative Drug Sampling (Reference D.2), page 48 states “In common practice, an acceptance criterion is that the sampling results are taken into consideration if the ratio between the standard deviation s and the average weight of a drug unit in the sample is less than 0.1 (RSD<10%). Otherwise, an increase of the sample size is required in order to reach the target percentage.” In casework, RSDs of sample weights higher than 10% may be encountered (see reference D.6). For such cases, when necessary and feasible, laboratory personnel may evaluate the RSD acceptance criteria based on weight and type (e.g. pharmaceutical versus illicit) of sample. When a sample size of greater than 10% of the population is used, a finite correction factor (Q) of should be applied to the combined uncertainty (Reference D.2). However, since this correction factor is always less than 1 and decreases as n increases, it reduces the total uncertainty. The finite correction factor was not applied to these examples as omission results in a more conservative estimate of uncertainty.